After you’ve stowed away the white dress, unwrapped all the gifts, and proudly gotten used to wearing your ring on your finger, you expect the effects of honeymoon bliss to carry over into your new life together. But is it really the happy beginning you expected? Here, learn about the many issues that newlyweds face, and how to weather the first, formative years of your married life. It’s True What They Say that you don’t just marry one person-you marry the entire family and all their idiosyncrasies. “Difficulties arise when a spouse remains socially and emotionally attached to either parent marriage. Each spouse should know that being married makes each other “the principle confidante.” “Each must be sensitive to the other’s relationship with his or her family, but at the same time realize that the couple relationship is more important than any other relationship.” If you find it difficult to relate with your in-laws, talk to your husband about how you should both deal with each other’s parents. 1. Plan Out Holidays. Deciding which family to stay with on holidays can be a burden if not planned well. Try to map out a fair and feasible plan with your husband. This way, you value each other’s family traditions, and along the way, you may be able to establish your own traditions with your new family unit. 3. Don’t Mistake Your Parents For Loan Officers. Part of starting a new life together is breaking free from the purse strings that your parents have been providing for you. As much as possible, make it a habit to work financial problems out with each other, instead of asking your parents for money. 4. Give The Process Time To Work. Don’t get impatient when change doesn’t happen right away. Both you and your husband are adjusting to each other and each other’s families, and those in themselves may already be a lot to absorb on your first few years together. Understand that loving your spouse’s families, as in all relationships, takes time and a lot of compromising. One Of The Problems that many newlyweds don’t foresee encountering in their marriages is that of conflicts arising from their family of origin. “We are profoundly affected by the attitudes and actions of the family we grew up in. The milieus in which you and your husband grew up in are entirely different, and getting married is basically taking those two different backgrounds under one roof, and trying to make it work. It can range from something as simple as holding annual vacations with your family, to things as complex as child-rearing styles, practicing religions, and resolving conflicts. “Find out who your partner is by digging into his past and looking closely at the family he grew up in. 1. 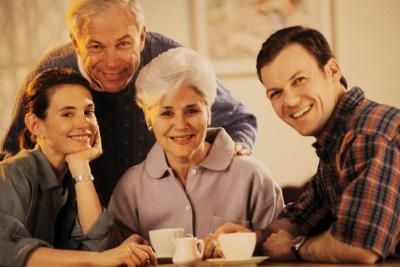 Spend More Time With Your Husband’s Family. Doing so makes you privvy on a very personal level to their family culture, and all the things that they value most as a unit (apart from the advantage that they also get to know you better). 2. Listen To Your Husband’s Stories About His Childhood. Whenever your husband launches into another story about how he grew up, take heed. This will clue you in on the practices he and his family might have shared, and his views on important matters, like how children should be raised. Take the list with you the next time you and your hubby sit down to talk about your financial situations. 5. Who Handles What? Which spouse will manage your joint accounts, assets, investments, and properties? If you want to go deeper into understanding you and your spouse’s expectations, particularly in the area of emotional communication preference, try out this assessment test created by marriage and family life expert. Your hubby can take it, too. It’s Important That You And Your Spouse share with each other your dreams and aspirations, so that you will know firstly whether or not they are compatible. You also identify which goals are negotiable and non-negotiable, to make compromising together a little easier. “There will be some dreams so strong that neither of you can put aside without great pain,” she says. “You can live with these differences if you learn to love one another’s dream.” Perhaps, you had your heart set on becoming a housewife, but his income may not be enough to support the lifestyle you both crave. Or, he had planned on a jetsetters’ life for both of you and you crave to only stay in one place. Realize that your personal goals may be different from the goals you and your husband may work towards as a couple, so talking it over thoroughly may help thresh out differing issues. Determine early on in your marriage about the roles you will assume at home, so that both of you can manage your expectations. 1. Will your husband earn both your keep, or would he rather hold the fort while you work? Or will you both be working, even when you decide to have children? 2. Who will do which chores-washing the dishes, doing the laundry, putting things back in order, etc.? Or, will you prefer to hire helper/s, and which spouse will manage them. 3. Who will have the last say when making decisions? Or will we always follow the unanimous decision rule? 4. Who will do regular accounting of expenses, and manage the budget, investments, and properties? You’re so ready to have a child, and he isn’t? Plan this next phase of your relationship carefully so as to avoid resentments, which often affect the way you raise your child. If he’s not yet ready, try to see where his unwillingness is coming from (e.g., possibly a family of origin issue) to understand better his side of the argument. If both of you are ready, decide when you would like to have children, how many you would like to have, as well as how many years there should be between them.